You are here: Home / Adam in the Media / Idol Backtrack: Top 11 – Adam Lambert Goes Country With the Tale of the Cat! From the glowing responses to last week’s introduction to Idol Backtrack, I can see that this series is a hit. Thank you for your encouragement! Nine years ago, after Jasmine Murray and Jorge Núñez went home, we were in the Top 11. While every week was cementing in our minds what a world superstar Adam would become, Top 11 his was the first of two pivotal Idol performances from him, in my opinion. Welcome to Grand Ole Opry Week fans!! Who can forget the complete game changer that Adam gave us this week? I’m talking about none other than Ring of Fire!! This magical performance taught us 2 things. Okay, 3 things. First, Adam’s fearless individuality. Second, his immensely sensual presence. And third, that the show gave us a compilation of 2 performances in the “LIVE” rendition. We know this by what I call the Tale of the Cat – Cat o’ Nine Tails, to be specific! Watch the video again, concentrating on his hips. I’m sure you won’t mind! Notice which hip Adam’s Cat o’ Nine Tails is on? At 11 seconds in and throughout most of the song, it’s on his left hip. But look at 27 seconds in – now it’s on his right hip. Four seconds later at :31 it’s back on his left hip and again at :54. Then at 1:17 it moves to his right hip again. And back on his left at 1:24 and 1:42. And on this version, we see the dramatic liplick at 1:00. For some reason, maybe for a technical need, the show spliced in what were probably some moments from the dress rehearsal, and we saw a lack of continuity. I can only guess that Adam took it off after the rehearsal and put it back on the other side for the show. However, in this next version, you can’t see the Cat o’ Nine Tails on the right side. Also, you don’t see the liplick because now it’s showing it from the rear. But what you do see on this version is the blue banner with the phone and text numbers. A little love from backstage that night! The above video didn’t show the intro or the judges’ comments, which were always a large factor. Below is a version that tells the complete story. Additional Moments – this was obviously posted by a Glambert! Tonight, Alexis Grace went home. Tune in next week for Top 10, which meant tonight Adam guaranteed himself a place on the unforgettable Summer Tour! Please keep letting us know how all this reminiscing makes you feel! I loved this performance! i would not of expected him to do anything different. He is truly an amazing artist! I was watching his hips from all angles (as usual), and never once noticed the “tail” switching sides!!! I love Adam’s version of Ring of Fire so much more than the original version by J. Cash!!! 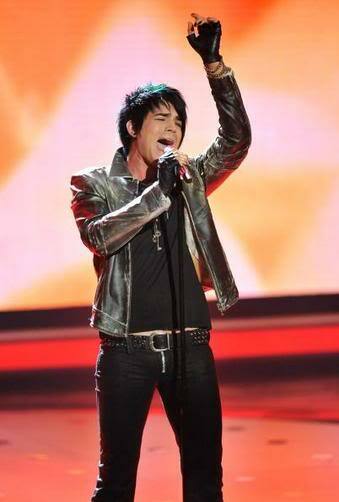 But I love everything Adam does/sings!!!!! Love watching these AI videos!!!! One of my favorite performances from the one and only! Love the man. This is the performance that made me sit up and really pay attention!! !